What are risk factors for developing a Morton's neuroma? What are symptoms of a Morton's neuroma? How do health care professionals diagnose a Morton's neuroma? What are treatment options and home remedies for a Morton's neuroma? What is the prognosis (outlook) for a Morton's neuroma? Is it possible to prevent a Morton's neuroma? Morton's neuroma is a swollen, inflamed nerve in the foot. Morton's neuroma causes a "burning" sharp pain on the bottom of the foot. Treatments for Morton's neuroma include resting the foot, better-fitting shoes, anti-inflammation medications, ice packs, and operation. A neuroma is growth (benign tumor) that arises in nerve cells. 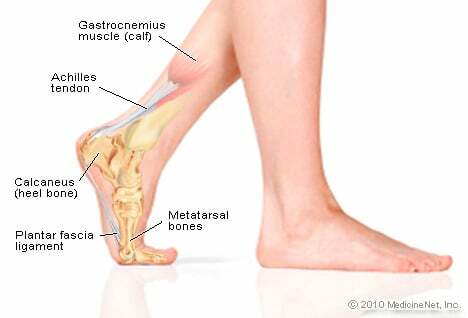 A Morton's neuroma is a swollen, inflamed nerve located between the bones at the ball of the foot. The most common location of a Morton's neuroma is in either the second or the third spacing from the base of the big toe. A Morton's neuroma is caused by compression of the nerve of sensation between the ends of the metatarsal bones at the base of the toes. Improper footwear that excessively binds the forefoot can lead to a Morton's neuroma. The outlook for a Morton's neuroma depends on the structure of the foot and whether or not simple treatments are effective. Conservative treatments include optimal footwear, cortisone injection, and resting the foot. When surgery is performed, the outlook depends on how much residual nerve damage exists. What are the best shoes for flat feet? How do high heels affect feet? What causes bunions? Learn about stress fractures, athlete's foot, and other conditions. What caused your Morton's neuroma? What was the treatment for your Morton's neuroma?